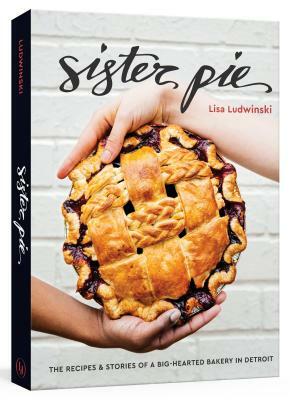 "Lisa Ludwinski’s Sister Pie is everything you want in a pie cookbook: careful directions, baker’s secret tips, inspired combinations (apricot-raspberry-rose, strawberry-pistachio) and a you-can-do-it attitude." "Bring the wisdom, quirkiness, and fun of the bakery to your home kitchen, and become a better baker along the way." "Spend five minutes with this book and you will want to befriend author Lisa Ludwinski. The book, like the Detroit bakery it’s named for, celebrates community spirit, a serious love of baking, and a playfulness (Ludwinski hosted a 24-hour dance party to raise funds to open the bakery). Pies are organized here by season and are anything but ho hum, with options like blueberry plum balsamic pie and cardamom squash tahini pie." "Eater’s own national critic Bill Addison says Detroit’s Sister Pie is the best pie shop in the U.S. This fact would be reason enough to order Sister Pie’s first cookbook, a gorgeously photographed and honestly written account of one team’s dedication to flaky pie crust, seasonal fruit, and unique pie-adjacent pastries. But the recipes will also appeal to bakers looking for new inspiration." "Lisa Ludwinski, who honed her baking skills at Milk Bar and Four and Twenty Blackbirds in New York before opening her bakery in Detroit, has filled “Sister Pie” with 45 thrilling pie recipes, like blueberry-plum balsamic, toasted-marshmallow butterscotch and malted lime. For the anxious pie maker, she includes detailed instructions that are mercifully easy to follow. But it’s not all pies: Thirty recipes for equally adventurous baked goods (peanut butter-smoked paprika cookies, rhubarb blondies) round out this bursting-at-the-seams book." "This stunning cookbook showcases the work of Lisa Ludwinski, whose recipes are nothing less than heartfelt." "We'd visit Detroit just to eat at this pie shop." "A friendly guide for all things related to fillings and crusts, both sweet and savory. . . . Complete with photographs, helpful hints like “paperclipping” cherries to remove their pits, and uplifting writing (“You did it! You are now ready to fill the pie”), this book will motivate readers to become their own master pie makers."